Louisville, CO (RestaurantNews.com) A new, large-scale consumer study conducted by Market Force Information (Market Force) reveals America’s favorite quick-service restaurant (QSR) chains in five popular food categories: burgers, sandwiches, Mexican, pizza and chicken. The study found In-N-Out is America’s favorite burger chain, Wawa ranked first for sandwiches, Chipotle for Mexican food, Pizza Ranch for pizza and Chick-fil-A for chicken. Nearly 11,500 consumers were polled for the study, which also reveals consumers’ QSR dining habits, brand preferences and in-restaurant technology use. In-N-Out fans are known for their fierce loyalty and – in many cases – their pleas for this regional burger chain to bring a location to their town. The California-based chain ranked No. 1 among burger chains in Market Force’s 2018 QSR study for the second consecutive year, followed by Culver’s in second place and Five Guys in third. In-N-Out also received the highest scores across all QSR food categories studied, making it America’s favorite QSR across the board. On the flip side, Burger King, Jack in the Box and McDonald’s ranked lowest among the 13 burger chains studied. [See Graph 1]. More and more, QSR brands are seeing competition from convenience stores and, for the first time in this study’s history, a convenience store was named America’s favorite spot to grab a sandwich. Wawa is a 54-year-old chain with more than 790 convenience retail stores on the East Coast. It offers fresh food selections such as custom-prepared hoagies, freshly brewed coffee, hot breakfast sandwiches, specialty beverages and an assortment of soups and sides. Wawa rose four places to unseat the 2017 sandwich category winner, Firehouse Subs, which slipped 15 percentage points to land in second place this year. Jersey Mike’s was third, followed by Jimmy John’s, Jason’s Deli and McAlister’s Deli [See Graph 3]. No single brand dominated across the eight customer experience attributes that Market Force studied, though Firehouse Subs took the top spot in two – food quality and atmosphere – and tied with Jersey Mike’s and Jimmy John’s for staff friendliness. Jason’s Deli came out on top for healthy options, while Jimmy John’s ranked highest for speed of service and overall cleanliness. Wawa was again No. 1 for value, five percentage points ahead of second place Subway. Arby’s was last in nearly all of the categories. [See Graph 4]. Pizza Ranch, an Iowa-based chain with 200 locations in 13 states, took the No. 1 spot this year in the pizza category, a title Marco’s Pizza held in 2017. Papa Murphy’s again came in second, followed by Marco’s Pizza, Domino’s and Papa John’s. [See Graph 7]. 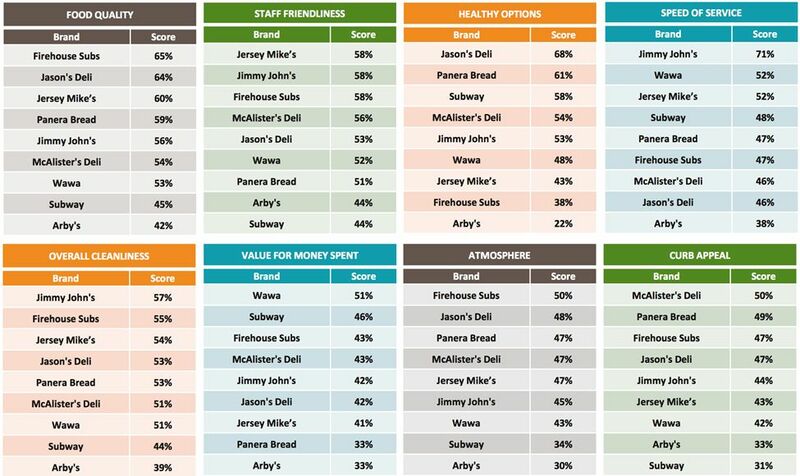 Pizza Ranch and Papa Murphy’s led in every customer experience category except value, which went to Little Caesar’s. Papa Murphy’s was No. 1 for food quality, healthy options and cleanliness, while Pizza Ranch was a clear winner in atmosphere and curb appeal and was also found to have the friendliest staff and fastest service speed, best atmosphere and curb appeal. Marco’s Pizza also performed well, landing in the top three in five key categories. [See Graph 8]. Chick-fil-A is America’s favorite chicken chain for the fourth straight year with a 73% score. Raising Cane’s ranked second with 68%, Zaxby’s and El Pollo Loco tied for third with 51% each, Boston Market ranked third with 46% and Popeyes rounded out the top five with 42%. KFC landed at the bottom of the 10 chains studied. [See Graph 9]. Once again, category-leader Chick-fil-A received the highest scores in every category except healthy options, a top ranking that went to El Pollo Loco for the third consecutive year. Raising Cane’s also performed well, landing in second place in seven of the eight categories. KFC was last in six categories, and Buffalo Wild Wings was rated lowest for value. [See Graph 10]. The use of technology by QSR guests to place their orders continues to steadily grow, with 39% reporting that they ordered their meals via smartphone app in the past 90 days, a significant increase from 2015 when just 11% reported doing so. Additionally, 28% used a kiosk and 27% used a tablet to place their order. [See Graph 11]. 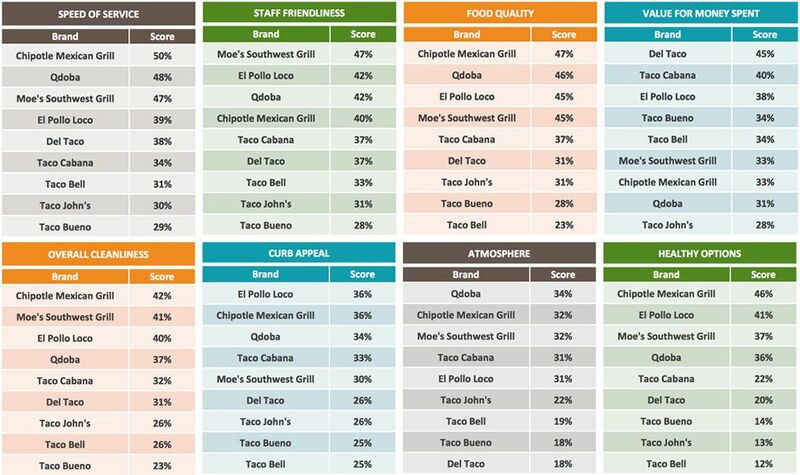 For the rankings, Market Force asked participants to rate their satisfaction with their most recent QSR experience, and their likelihood to refer that restaurant to others. The results were averaged to attain a Composite Loyalty Index score. Only chains that received at least 100 votes and representing 2% or more of votes were analyzed. The survey was conducted online in February 2018 across the United States. The pool of 11,487 respondents represented a cross-section of the four U.S. census regions. Fifty percent reported household incomes of more than $50,000 a year. Respondents’ ages ranged from 18 to over 65. Approximately 73% were women and 26% were men. For more information on Market Force’s services for the restaurant industry, visit http://www.marketforce.com/industries/restaurants. Market Force Information® is a customer experience (CX) management company that provides location-level measurement solutions that help businesses protect their brand reputation, delight customers and make more money. Solutions include customer experience surveys, employee engagement surveys, mystery shopping, contact center services and social media review tracking, which are integrated into one technology and analytics platform, KnowledgeForce®. Founded in 2005, Market Force has a growing global presence, with offices in the United States, Canada, United Kingdom, France and Spain. It serves more than 200 clients that operate multi-location businesses, including restaurants, major retailers, grocery and drug stores, petro/convenience stores, banking & financial institutions and entertainment brands. The company has been recognized as one of the top 50 market research organizations in the AMA Gold Report and by Forrester as a Breakout Vendor. For more information about Market Force, please visit us online at www.marketforce.com.